Have you ever heard of art for your kitchen appliances? I was not familiar with it either until I was recently introduced to Appliance Art™ which has a fabulous selection of magnetic art for your dishwasher, refrigerator and other appliances. What a wonderful concept because in just a few seconds I was able to transform my plain ivory dishwasher into a lovely showpiece that has gotten lots of compliments from friends and family. My husband (whose nickname is Rooster) and I have a country themed kitchen that features roosters and hens in honor of our beloved laying hens. 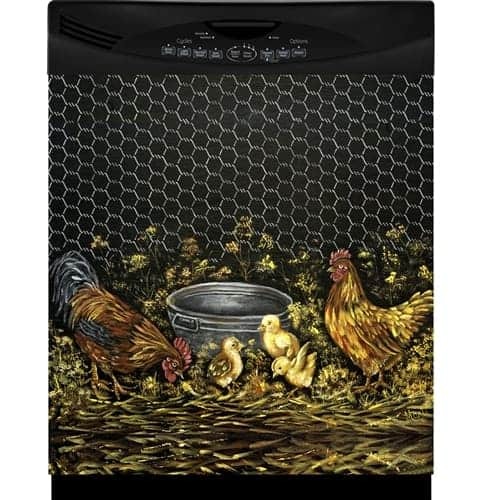 I selected the “Rooster & Family” dishwasher art and it is the perfect addition to personalize our kitchen décor. Even my husband who does not normally get involved with decorating commented that it really livened up our kitchen and the design was quite nice. We were able to choose from Magnet or Vinyl styles and then select the size (small or large) that would perfectly fit our appliances. Appliance Art™ has a wide variety of appliance art to suit virtually every taste and style and you can change out your artwork to decorate for the holidays too. You can even turn your plain appliance into a “stainless steel” beauty with easy to apply instant film or a panel from Appliance Art. How about coordinating with a matching appliance combo art set such as the Caffe Coffee Art or Old World Wine just to name a few of my favorites? With prices so affordable at Appliance Art™, don’t replace your appliances merely for appearances sake. I recommend visiting Appliance Art™ to purchase your favorite design and update your kitchen in mere seconds. You are invited to browse the entire collection by visiting the Appliance Art™ website. Which one is your favorite? Hi! I ran across your comments when searching to learn more about these products. I am wondering about purchasing a black cover for my bisque color fridge, but am wondering if it would just look weird . . . edges of doors showing, etc. What is your opinion? Thanks! We have had quite an issue with this company. They will not respond to phone calls or emails,regret ever doing business with them. Did you ever receive your merchandise? I am having the same problem and in seeking reviews came across this post.